It’s been a couple of weeks since I went to New Jersey to visit with a customer whom I had been wanting to meet for a long time. I’ve heard great things about this company, and I know we have opportunities to partner on some good things! So, my colleague (and now frequent road trip buddy) and I set out to Middlesex, NJ to have a couple of meetings as well as a nice dinner up the street at Vincenzo’s with our customers. Foolishly, I only brought my small Clemson clutch with me, which funny enough, my dear girlfriend who lives in New Jersey gave me as a gift earlier this year. Anyhow, the point being that I forgot to bring my blog card with me. Thank goodness for mobile phones. I called it up from the blog page itself! I had been warned that this dinner and our dining companions were going to be fabulous, so I came hungry! In addition to fabulous table mates, our server, Carlos, was perfect. He was professional, yet was equipped with a biting sense of humor. The best of both worlds! Carlos started us off with several appetizers: calamari (two ways: fritti and with an “Italian hot sauce” – which everyone at the table claimed was Thai sauce! ), escarole and pignoli nuts, and sausage and peppers. To be honest, I was full by the time we worked our way through these delicious plates of apps! A mesh of apps! Calamari, sausage and peppers, and escarole. And then came this salad… I think it’s one of my favorite salads – ever. The tri-colore insalati. The mesh of flavors – and that cheese! Heaven on a plate. Tri-colore salad made of European blend, tomatoes, pepper, and parmagiano cheese. I’d say finally, because it really should have been the final set of bites, but it wasn’t. This is the penultimate dish. Grilled salmon over escarole and served with roasted potatoes. Without flinching while reading the blog card, Carlos had chosen a popular dish that evening – salmon over escarole with roasted potatoes. The salmon filet was enormous, and cooked to perfection. Those who know me know that salmon is not my favorite seafood, but when cooked well, I really do enjoy it! I loved that there were some greens on the plate and just a few potato bites. It was a simple, delicious dish and light enough not to pain me after all of the appetizers! It was then that our customer insisted that we all have dessert. What?!? How was I going to fit one more bite into my mouth and belly? Chocolate banana pie with fresh whipped cream, strawberries and mint. I mentioned “heaven on a plate earlier”. This banana chocolate pie is heaven on a plate served by singing angels! I could have eaten two or three slices (but I didn’t!). Since I’m not a huge connoisseur of salmon, I’m curious to know your favorite way to prepare it. I’d love to try more recipes at home. Please leave a comment if you have a recommendation. Not all posts have to be long narratives, right? Today, I flew from MKE to DTW – where I was delayed, delayed, and further delayed before finally making my way to PHL. I was attempting to meet my colleague for dinner prior to a customer visit tomorrow morning. It turns out he was even further delayed and we missed the opportunity to meet up. 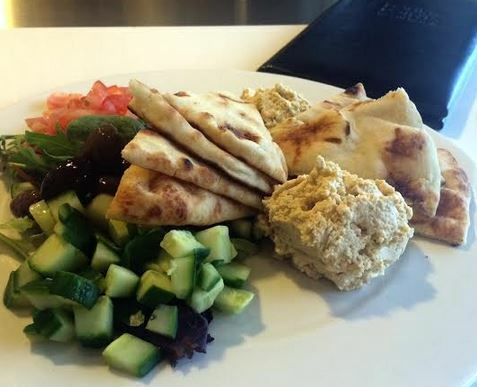 Hummus, Kalamata olives, cucumbers, tomatoes and mixed greens, with warmed pita points. It’s not what I had in mind when I thought Loren and I would meet for dinner, conversation, and business discussions, but it’s the reality of business travel sometimes! And, the hummus was tasty, the veggies were fresh, and the dish was light. I could have done much worse! I’m off to Vegas for work next week (I’ve already refilled my anti-anxiety pill prescription, knowing what that city will do to me!). I am, however, looking forward to some good food! 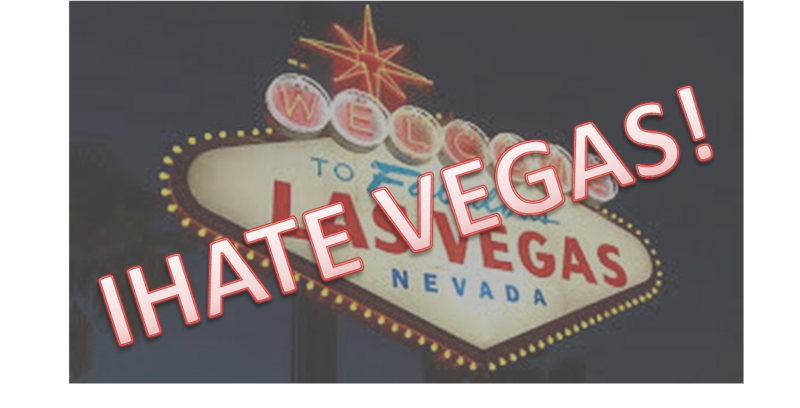 If you have any “must-do” suggestions for Vegas, I’m open to reading them in the comments! I need all the help I can get to survive that nutty place! I’ll be flying out to Düsseldorf on Sunday, for a weeklong business trip in Europe. One of the many perks of working for a French-based company is the “required travel to Europe”. On Tuesday, I’ll fly from Düsseldorf to Paris and will be spending most of my time in Compiegne. You may recall my visit to Brussels last fall, and then a short train ride over to Paris from there. I had a couple of excellent meals during those trips, and I’m hopeful for more delicious dining adventures this time around. My colleagues are aware of my approach to dining out (well, most of them are), so rather than being an awkward experience, it’s fun to grab meals with these guys. I’ll be sure to post about my European adventures, so please keep an eye out! And, if you have recommendations for any must-visit restaurants, please leave a comment!